Cooper, 7 wks, loves to wrestle!!!!! I have always had large breed dogs but due to size restrictions i had to look around for a small breed of dog so we finally decided on a Jack Russell. WOW, what have i been missing!!!!!!!!! We brought Cooper home early in November aged 6 weeks and he has bought so much love and joy to our household with his sometimes naughty streak but mostly just unconditional love. I feel like a new mum again, i can't wait to get home from work to play with him or just sit and cuddle with him. I'm converted, and so much in love with him!!!!!!! 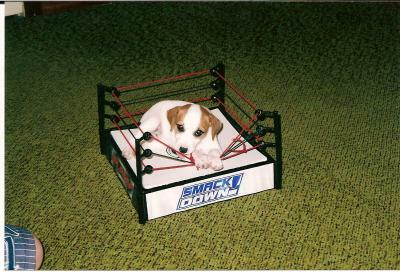 Oh how I wish I could wrestle with adorable little Cooper!